Truman Bookstore and SUB Celebrated "I Got Potter'd at the SUB"
Charles M. Foudree will deliver the commencement speech at 6:30 p.m., Aug. 5, on the Quadrangle. The commencement rain site is Baldwin Auditorium. About 106 undergraduate and 72 graduate students will be marching during the commencement ceremonies. In addition to these graduates, Truman will have 21 golden alumni, who graduated from 1955 and prior to participate in the ceremony. About 35 golden alumni will attend the Golden Alumni Reunion luncheon at 12:30 p.m. in the Student Union Building Georgian Room. A reception for all graduates will follow commencement on the Quadrangle. Foudree devoted his entire career to the field of accounting and finance. He retired as executive vice president of finance for Harmon Industries after 27 years of service to the company. Harmon Industries Inc., located in Blue Springs, Mo., is a worldwide supplier of high-tech signal and train control products and manufactures an extensive line of equipment designed to improve the operating efficiency and safety performance of its customers. Foudree went to work for the company in 1972 and was named executive vice president of finance of Harmon in 1986, the position he held until he retired in July 1999. Prior to that, he was employed by Peat Marwick Mitchell and Company for six years as a Certified Public Accountant. In 1995, Foudree served as Truman’s Division of Business and Accountancy’s Executive-In-Residence, and he is a past president of the Truman State University Foundation Board of Directors. He is active in Truman’s Kansas City Alumni Chapter and was named Truman’s 1999 Alumnus of the Year. 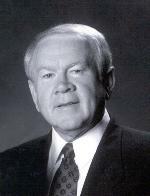 Foudree graduated from Truman State University in 1966 with a Bachelor of Science degree in accounting. Foudree is a member of the Financial Executives Institute. He is past director of the national organization and past president of the Kansas City chapter. He is also a member of the Missouri Society of Certified Public Accountants, of the American Institute of Certified Public Accountants and the Independence Rotary Club. Foudree is a member of the Administrative Board and past chairman of the Board of the Christ United Methodist Church of Independence. He currently serves as director of Sceptor Industries, Inc., Carondelet Health and Friends of Powell Gardens Board. He serves as a director and treasurer for the Harry S. Truman Library Institute. He also serves as the director and chair of finance committee of the St. Paul School of Theology. He and his wife, Colleen, reside in Lee’s Summit, Mo., and have a daughter, Melanie, and a son, Mark. Truman State University President Barbara Dixon (left) and Bob Jones, head of the fine arts division and professor of art, (right) present Avril Frick (center) a check for $4,000 from the Presser Foundation. 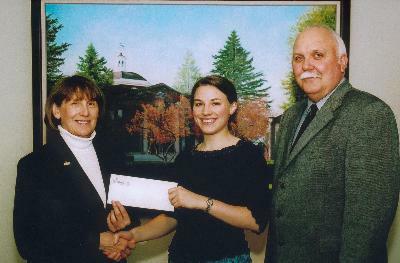 Avril Frick, a music major from Oakville, Mo., has been named a Presser Scholar for the 2005-2006 academic year. The Presser Scholarship is given to an outstanding music major at the end of his or her junior year. The foundation’s grant of $4,000 was awarded to Frick at the spring Fine Arts award ceremony in April. Theodore Presser is remembered not only as the publisher of Etude, the music magazine, and the founder of the great music publishing firm bearing his name, but as a philanthropist who specialized in music education. Frick is involved in Campus Crusade for Christ, in addition to a number of music department organizations and activities at Truman. Daryl Fazio, assistant professor of art, wrote “Georgia Out of My Mind” specifically for the 10-day Minnesota Fringe Festival (http://www.fringefestival.org), running from Aug. 4-14 in Minneapolis. The hour-long play is a two-woman, 10-character slice of Southern life hinging on the search for a missing former debutante and will be performed five times during the festival. Part comedy, part drama, part mystery, part character study, and part utter nonsense, “Georgia” is Fazio’s second play. Her first play, “Greyhounds,” was produced Off-Off-Broadway this July at New York’s American Theater of Actors after receiving its world premiere in Kirksville in 2003. The production features Fazio and Becky Becker, associate professor of theatre, in the play’s 10 roles with Joan Mather, professor of theatre, as director. The company also involves Benjamin Knoll, a junior theatre major from St. Louis, and Katie Rose, a senior English and theatre double major from Cape Girardeau, Mo., as stage manager and scenographer. Knoll and Rose received a grant to help them pay for travel costs, as well as to produce a documentary on the rehearsal process and ultimate Fringe experience. Fringe Festivals, a concept which originated in Edinburgh, Scotland 50 years ago when uninvited performers entertained crowds on the outskirts of the Edinburgh International Festival, now take place all across the world. Minnesota’s festival is the longest-running of the U.S. Fringes, this summer holding its twelfth. There are more than 150 shows in a dozen venues vying for audiences from the more than 40,000 people who turn up for the Festival annually. The duo will be performing a public dress rehearsal before they leave for Minneapolis. This dress rehearsal will be at 8 p.m., Aug. 2, in the Ophelia Parrish Black Box Theatre. Admission is free, but donations are accepted. “Georgia Out of My Mind” will show Aug. 4 at 10 p.m., Aug. 5 at 5:30 p.m., Aug. 6 at 4 p.m., Aug. 11 at 8:30 p.m., and Aug. 12 at 10 p.m. at the Interact Theater, 212 North Third Avenue, in Minneapolis. An endowment fund designed to provide perpetual resources to support the programs and activities of the University has been established at the Truman State University Foundation. The Truman State University Endowment Fund for Excellence will provide funds to meet the greatest and changing needs of delivering a high quality education to students. The fund has been fortified with two recent gifts of $25,000 each from George ‘36 and Nadine ‘33 Wilson of Arlington, Va.; and Dr. Jack ‘57 and Berneita ‘55 Rice of Lindale, Texas. Earnings from the endowment will support a variety of value-added student learning experiences, and may include study abroad, technology and equipment upgrades, scholarships, faculty development, library enhancements and other programs deemed to benefit students and student learning. The fund will be administered by the Truman State University Foundation Board of Directors, with discretion from the University President. While the majority of Foundation funds are restricted for designated purposes by donors, the Truman State University Endowment Fund for Excellence provides a significant giving opportunity for current major and planned gift donors to meet evolving needs of the University. The Truman Bookstore and the Student Union Building sponsored "I Got Potter'd at the SUB" to celebrate the release of the new Harry Potter book from 10 p.m.-1 a.m., July 15, in the SUB. 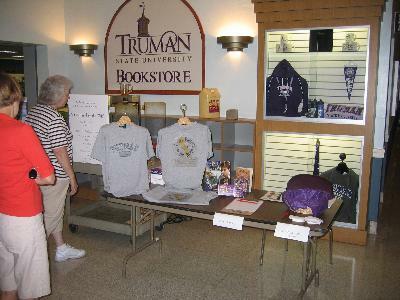 Employees in the SUB and the Truman Bookstore hosted the event for fellow members of the University community. The bottom photo pictures two girls who dressed up for the Best Dressed Costume contest. 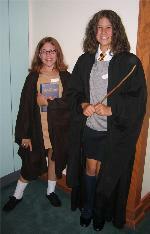 Additional activities included Potter Trivia and a Potter Spelling Bee. Aug. 2-5 - 11 a.m.-2 p.m.
Aug. 8-12 - 11 a.m.-2 p.m.
Aug. 15-19 - 11 a.m.-2 p.m.
Aug. 8-12 - 8 a.m.-5 p.m.
Aug. 15-19 - 8 a.m.-5 p.m.
Aug. 22 - 1 p.m.-5 p.m.
Marijke Breuning, associate professor of political science, and John Ishiyama, professor of political science and director of the Ronald E. McNair Program, have been notified that their chapter, “Foreign Aid, Democracy and Political Stability in Post Conflict Societies,” has been accepted for publication in Managing and Resolving African Conflicts. Vol. 2: Conflict Resolution and Post-Conflict Reconstruction, to be published by OSSREA/James Currey. Chizoba Ifeorah, a junior biology major from Fresno, Calif., participated in Summer Medical Education Program (SMEP) at Fisk/Vanderbilt University from June 2-July 15 in Nashville, Tenn. The Truman Board of Governors will meet at 1:30 p.m., Aug. 5, in the Student Union Building Conference Room. The Department of Public Safety is offering a van driving class at 9 a.m. and 2 p.m., Aug. 15 and Aug. 16, at the Public Safety Building. There is limited class space available. Those who would like to attend should reserve their space by calling Joyce Burnett at 785.4177. The next issue of the Truman Today will be a Truman Week special edition published Aug. 22 and distributed to first-year students. The Truman Today will resume weekly publication beginning Aug. 29. Submit news items for that issue by Aug. 24 to kbest@truman.edu. Members of the Truman community can access materials online from the Truman Master Plan and Assessment workshop that took place July 19. Please note that to view the documents, users must access the site from a Truman IP. Go to http://vpaa.truman.edu/communications/mpaw/2005/index.stm to view information from the “Preparing for a Third Decade of Excellence in the Liberal Arts” workshop. The Writing Center, located in McClain Hall 300, will be open for consultations beginning Sept. 6. Hours will be announced at a later date.